My third election pledge is to secure better and cheaper local transport for Southport. We have recently seen on the East Coast mainline the benefits of publicly run rail operating companies. As Southport’s MP I would be voting for Labour’s policy to allow more train operating companies to become publicly owned and for them to work in the best interests of passengers and not just shareholders. This policy will ultimately bring about improvements in both Merseyrail services to Liverpool and Northern Rail services to Manchester. We have seen a recent reduction in our local bus services because of changes instigated by bus companies in addition to bus services going out of business. Labour recognise that buses are a lifeline for many people and are too important to be left to the whims of business and shareholders. That’s why I’ll support the Labour policy of re-regulating our buses which will mean Merseytravel can provide a truly integrated transport system, with more affordable fares, in a similar way as London Transport. I have already discussed our local travel situation with the chair of Merseytravel, Liam Robinson. Liam shares my concerns that Southport risks isolation if the Lib Dems wish for a separate Southport council ever became reality. Liam confirmed my fears that residents could risk losing free bus, rail and ferry travel anywhere across Merseyside for all residents over 60 and that any multi-modal, multi operator zonal tickets e.g. Saveaway, could cease to be valid in the Southport area. We also discussed the potential for introducing a waiting room at Southport station. Anyone in Southport who drives a car knows that we pay more for our fuel here than in neighbouring towns. I have already written to the CEO’s of Tesco and Morrison -; our two principal filling stations here -; asking them to explain the reasons why it can cost Southport motorists many pounds extra to fill up. As your Labour MP in a Labour government I will be able to properly pursue issues like these that are hitting our town. 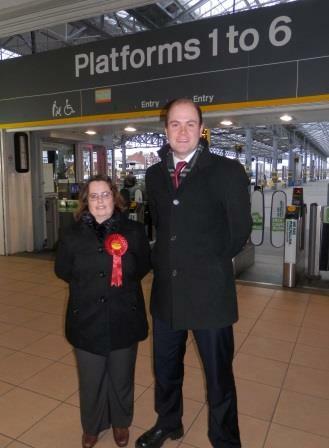 Liz is pictured at Southport station with Merseytravel chair Liam Robinson.